The correspondence course that AFA offers provides comprehensive study material prepared by the alumni of the top fashion and art institutes and is self explanatory. The course material covers all areas tested in NID, NIFT, PEARL,IIAD,UID, SRISHTI and other fashion and art entrances exam.viz. Quantitative reasoning, Verbal reasoning, Reading comprehension, Analytical and logical reasoning, and Data Interpretation Drawing Ability, Creative Ability, Thematic Apperception Test, Studio Test and Situation Test.. The study material has been prepared with extreme care to provide you with the necessary ammunition to face Fashion and Art Entrance Examinations. The correspondence course that AFA offers provides comprehensive study material prepared by the alumni of the top fashion and art institutes and is self explanatory. The course material covers all areas tested in NID, NIFT, PEARL,IIAD,UID, SRISHTI and other fashion and art entrances exam.viz. Quantitative reasoning, Verbal reasoning, Reading comprehension, Analytical and logical reasoning, and Data Interpretation Drawing Ability, Creative Ability, Thematic Apperception Test, Studio Test and Situation Test. The study material has been prepared with extreme care to provide you with the necessary ammunition to face Fashion and Art Entrance Examinations. 7 Books Set for preparation of UCEEED B.des. Which includes books on Visualization & Spatial Awareness, Observation & Design Sensitivity, Environmental & Social Awareness, Language & Creativity, Logical & Analytical Reasoning & Mathematics with Test Series. Set of 9 Books for preparation of NID Under Graduate Programmes..
Set of 10 Books for preparation of NID Post Graduate Programmes. Set of 15 Books for preparation of UCEED + NID Under Graduate Programmes..
Set of 16 Books for preparation of UCEED + NIFT Under Graduate Programmes. Set of 9 Books for preparation of CEED Programmes. Set of 11 Books for preparation of CEED / NID Postgraduate Programmes. 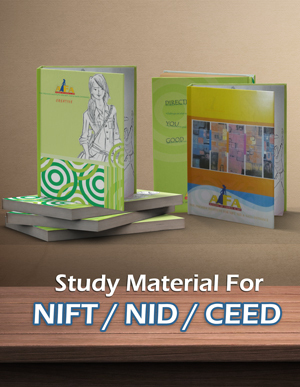 Set of 17 Books for preparation of CEED + NID + NIFT Postgraduate Programmes. Set of 17 Books for preparation of NID + NIFT Postgraduate Programmes. Set of 17 Books for preparation of UCEED + NID + NIFT Undergraduate Programmes.